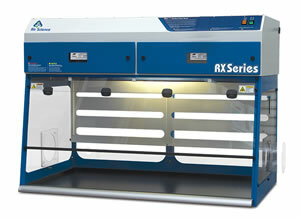 Purair® RX Balance Hood is a Class I enclosure that meets USP 800 requirements for non-sterile compounding procedures. The Purair RX is designed to protect the user and the environment from hazardous powders and particulates generated on the work surface. At the heart of the Purair product line is innovative ductless technology that creates a safe work environment in a wide variety of applications throughout the industry. Protects the operator from powder and particle hazards encountered during non-sterile compounding. SafeSwitch™ Filter Shutter System (optional) for safer bag-in/bag-out filter exchange. Innovative filter clamping eliminates by-pass leakage. Airflow monitor with low airflow alarm built-in. Complies with USP 800 guidelines which specify hazardous materials must be compounded within the proper work environment associated with both sterile and non-sterile products and preparations. A. Filter I.D. Window: A strategically placed front cover window shows the installed filter part number and installation date to encourage timely filter replacement. B. Side Waste Chutes: (Optional) Purair RX hoods are available with 6" diameter side waste chutes to safely transfer waste from the work surface to the proper disposal receptacle. C. Rear Internal Baffle: Rear baffle provides smooth horizontal airflow pattern. Removable for easy cleaning. Purair P5-36-XT (RX), shown with optional mobile cart. D. External Exhaust Connection: Standard 6 in. diameter exhaust connection port to allow for outside ducting. USP-800 compliant. E. Built-in Lighting: Hoods include standard 60W lights to fully illuminate the work surface. F. Air Velometer: (Optional) An analog air velocity meter in the field of vision of the user. G. Hinged Front Sash: When closed, the cabinet sash protects the contents from inadvertent external contact, and better isolates the air within. The sash is easy to open and close and features a self-locking feature. H. Control Panel: Electronic controls and displays include switches for the blower and low airflow alarm. Ergonomics, safety and aesthetics all come together with the 10º pitch of the face. I. Steel Support Frame: The chemical resistant epoxy coated steel frame adds mechanical strength. Optional all polypropylene construction is available if desired; see Accessories. J. Electrostatic Pre-Filter: The 99.5% effective electrostatic pre-filter is accessible from inside the chamber to contain the release of any particulates that it traps. The pre-filter can be changed while the unit is operating to prevent operator exposure to chemical vapors. K. Pass-Through Ports: Electrical cords and cables are safely routed into the cabinet through 1 5/8". diameter ports on the back and side walls. L. Airflow Alarm: A continuous air velocity monitoring system alerts the operator upon unacceptable values. M. Built-in Blower: All models include an internal blower. 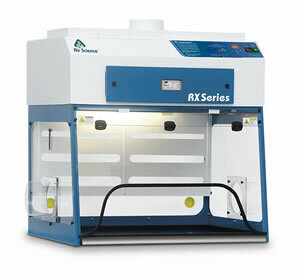 With the addition of an optional remote blower and additional ductwork the cabinet can be connected to an existing facility exhaust system. N. Internal Manual Speed Controller: Authorized personnel may set the centrifugal fan motor speed as desired. O. Stand: Optional mobile cart with locking casters. P. Work Surface: The internal work surface can be fitted with an optional stainless steel tray (epoxy resin surface is standard); see Accessories. Q. Filter Door Key: Filter access keys prevent unauthorized removal or accidental exposure to dirty filters. 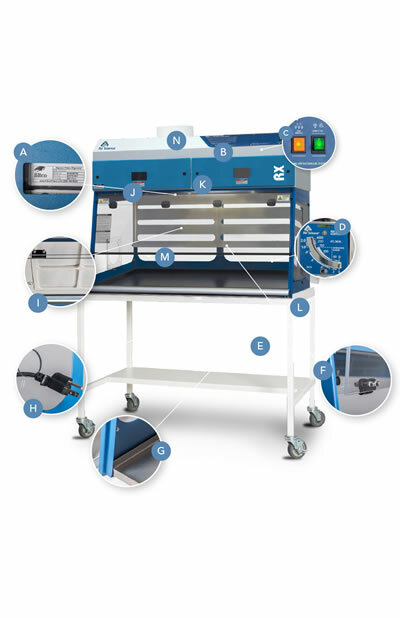 360 Degree Visibility: Clear back and side panels allow ambient illumination into the chamber and provide users with an unobstructed view of its contents. This also helps eliminate operator fatigue. Standards Compliant: Performance specifications and construction meet or exceed OSHA, ANSI and relevant international standards to assure operator safety. 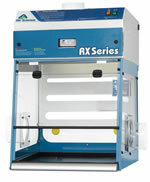 Purair RX enclosure hoods are USP-800 compliant. SafeSwitch Filter Shutter System: (Optional) A unique filter shutter system closes the exposed filter media face and minimizes exposure to the contaminated filters, protecting the operator and the environment. 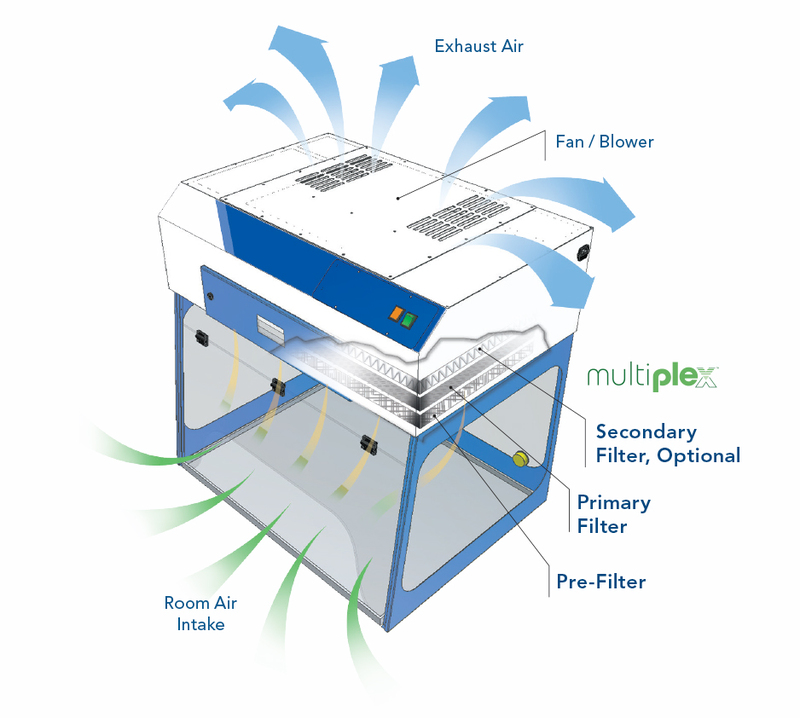 Learn more about the Purair RX Ductless Balance Enclosure line by downloading the brochure or by visiting our Specifications tab that includes information for each model.